Where do you turn when you hit a wall? I’ve been running into a lot of walls lately. Maybe they are walls I made. Maybe they are just there because no one said life would be easy. I don’t feel entitled to happiness and I know that some days (weeks…months?) are just harder than others. Still, when I am in those times – those moments, how do I cope? How do you cope? I tend to vacillate between prayer and scripture to keeping busy and self-help books. If I am honest, those things help for a moment and maybe I feel better, but when things are hard, they are still hard. No matter how I am “feeling” at the moment. I trust my faith. But I am still human and it’s a challenge to just…trust. I am. I want answers. Yesterday. When my boys were very small and they had issues, it was me at 4am googling every phrase I could think of to describe “crying baby don’t know what he wants”. I not only needed to know the problem. I needed to know the source of the problem, whether or not I caused the problem and the likelihood of the problem ever happening again. I’m exhausted to say that this pattern carries over into most other areas of my life. I’ve never considered myself to be a workaholic. Before I was married in fact, I was the farthest thing from it. I had absolutely NO issues leaving my work at the office, often stayed up too late and barely made it to my desk on time the next morning. Being a stay at home mom and now working from home has blurred all of the lines. There is no clock to punch and I find that bedtime for the kids simply means it’s time to get to work and keep going – in a different direction. Last night, my husband and I talked for an hour. We just talked and laughed about whatever. It was so nice. And so unusual. And so pleasant. When I hit snooze on my alarm at 5:36am for the 4th time this morning knowing that I needed to get up and get going, I just sat there wondering when I became this person who could no longer enjoy sleep or sit still long enough to watch a television show. It’s as if I no longer know how to really relax. Will you take it out or talk it out? The past week has been especially trying. My patience levels are at an all time low and I know I am coasting. Maybe I am finally running out of gas? I’ve reached out to a few friends to just connect and communicate (commiserate?) and just these few conversations have been life-giving. It’s so funny to me, that I write for a living and I still lack communication skills. My takeaway though is that I don’t want to take out my frustrations on the people around me. The people I love the most and for whom I do all of these things. All of the things that frustrate me, when you really get to the root of them, are the things I do because I love my husband and my boys more than anything in the world. So I push through walls and I fix. But sometimes, these things create their own walls. And I need to just sit and chat. Have a slow cup of coffee with a friend or a long talk with my husband. Listen to unmet needs and realize that we are all human. That life isn’t a race. That each day can be so beautiful even in the hardest moments. That it’s ok to coast for a bit. The hard moments don’t always get fixed. Even when walls come down, there is a mess of dirt and bricks to contend with. 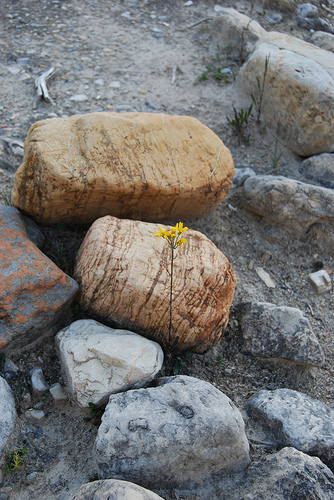 Sometimes the true beauty lies in the rubble. Hormones, hair, having it all and going bald. What a great verse to go with your thoughts! Sorry to hear you are having a tough week. Hopefully rest and calm are in your near future. Or at least a good friend to share a glass of wine with. Or a box of chocolate. Or, both! It can be such a challenge! Especially if sleep is an issue too. Ugh. Hang in there!